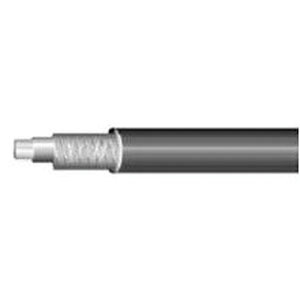 Omni Cable 18-AWG RG6 Series Direct burial coaxial cable has 100% aluminum foil and 40% braided aluminum shielding. The cable with foamed polyethylene insulation, has a dielectric strength of 0.170-Inch. Bare copper/tinned copper/copper covered steel/aluminum cable has a nominal outer diameter of 0.272-Inch over jacket. It has a nominal capacitance of 16.2 pF/ft. It is suitable for 75-Ohm video distribution and MATV/CATV broadband cables. The coaxial cable meets UL, CM, CMR, CMP, CATV, MATV and CATV-P standards.